It’s been a wild ride these past few weeks visiting some islands in Thailand exploring a few of the more known islands. There’s so many islands down here that one would need a helluva lot more time and money than I have at my disposal to experience them all. 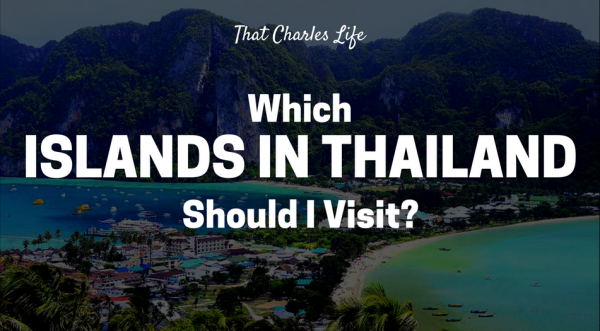 Here’s a little review of the main ones that I visited and some stuff you can get up to yourself as well while exploring islands in Thailand. The beach from.. The Beach, beautiful clear water, and the viewpoint laying background to at least one instagram photo of every white girl who’s ‘traveled’. How can Phi Phi not make it onto your itinerary for islands in Thailand? After leaving Chiang Mai, I flew down to Phuket to stay overnight before jumping on a ferry over to Koh Phi Phi. I’d heard multiple mixed reviews of Phuket so I didn’t stay there for more than 12 hours between Chiang Mai and Koh Phi Phi. It’s a few hour ferry ride from Phuket to Phi Phi. Use 12go.asia for booking all your ferries and buses. Phi Phi is something I’d never experienced. True island life. There are no vehicles, just little paths through a mini village comprised of hostels, bars, massage parlors, tattoo shops and clothing boutiques. There are mountains on either end of the island that makes it mostly uninhabitable. Along either side of the middle part where the town/village is, are beaches and hostels. By day people rent long tail boats and kayaks to explore little hidden beaches around the island that you can’t walk, take booze cruises or lounge on the beach. The night.. A bit of a different story. If you don’t want to party, Phi Phi probably is not for you. Everynight along the beach mimics the full moon party with raging music, fire dancers, buckets and dancing. Literally every single night. The music stops abruptly at 2am, but if you are staying near the beach, don’t even think about sleeping before 2am. Inside the village there are various bars where the party continues to late into the morning. There is also a Muay Thai arena you can watch or volunteer to fight in. Winners get a free bucket. I stayed 4 nights and that was 2 too many. If you are staying on the beach, one or two nights is probably fine. Stay at Ibiza Pool Party or Blanco Hostel. Otherwise book a hotel or resort a good distance from the beach. Do the Blanco booze cruise. It’s 2000 baht and includes free alcohol, monkey beach, Maya beach (the beach) and it’s cover entrance (450 baht) and also snorkeling and kayaking. It’s about 7 hours and a complete blast. Rent a kayak and find some hidden beaches. Nu beach was my favorite. Get a bamboo tattoo. There are so many shops here and it’s a common thing to do on this island. I didn’t do it, kinda wish I had. Explore the beach at night. It’s a wild party. Walk up to the viewpoint for sunrise or sunset. Signs line the little paths in the village how to get to the viewpoint. There are two parts, make sure you visit the 2nd point. It’s the best. I was so ready to leave Phi Phi, as my last night there I had food poisoning. If you didn’t get food poisoning in Asia.. did you even go? There is a mix of ferries and buses from koh phi phi to koh phangan as they are on opposite sides of the mainland. It took about 10 grueling hours. But it was cheap. Koh Phangan is a larger island than you expect and the roads are within the top ten most dangerous in the world. Rent scooters, but drive with caution. I did the full moon party. It was wild no doubt, like a large music festival on the beach. Multiple stages and fire dancers, etc. The average attendance is around 30,000. The rest of my time in Koh Phangan was spent scootering around the island exploring beaches and waterfalls. There is literally so much to do on this island. Plan your trip to include the Full Moon party. It’s an experience everyone should have. Stay at Golden Beach Resort in Baan Tai. Its a 5 to 10 minute drive from both Haad Rin where the full moon party is, and all about the same distance to the pier where there are many bars and restaurants. It’s a bit quieter of a place with AMAZING service (seriously the staff was so good to us) and extremely beautiful ocean views. If you want a more party experience in the hostels try SlumberParty. Or something in Haad Rin. Be careful driving scooters. But definitely rent them and explore some different beaches in the northern part of the island. That’s where the best beaches are. Malibu beach was amazing. Go to Eden party. I didn’t do this, but I’ve heard from locals it’s even better than the full moon. Visit the Slip & Fly. Just google it. Skip the mushroom shakes at the full moon party on Mushroom Mountain. I didn’t indulge, but everyone who did that I spoke to said they were awfully weak. Sad to leave Koh Phangan but excited for my next adventure of Scuba Diving in Koh Tao, that’s where I headed next. As soon as I arrived I forget completely about everywhere else in Thailand. As most people do, I fell in love with this island. Everything is close, its stunning and just real good vibes. I did my open water PADI at Bans Diving Resort and it included free accomodation. Diving is one of my new favorite activities. I extended my stay and did the advanced open water class because I loved it so much. Koh Tao has not necessarily the best diving in the world, as is the common misconception, but it is the cheapest in the world. I spent most of my time diving here so all I can recommend is staying and diving at Bans. Visiting High Bar for the views and some happy party flavors if that’s your style. Also visit Secret beach for the sunset views. If you’re diving at Bans. Request instructor Neil. He’s an older English dude and a top notch instructor. Stay tuned for my review of Cambodia and to hear how bad I got scammed, robbed, and mildly sexually assaulted. As always, thanks for reading! If I’ve missed anything please let me know in the comments. Or share with your friends if you think they could use some of my advice/perspective.